i would suggest who ever is looking to book a stay,, please please avoid, this is not at all worth a stay, this place stinks , it has got no ventilation , no lift,bed bugs, u name it u get it!!! u will get more decent place to stay with the same budget if u go around manually than t book on the internet,, i felt i was a dumb head by booking this hotel!!!! Near all transport facility except Air. Hotel staffs are friendly with smiling face. Takes care even at midnight if the residents remain outside on tour. Especially the young manager(? )helps with sincerity to make a local or outside tour. Room is good in size, but less ventilation. Bathroom has no ventilation, that`s it always emits bad odour. 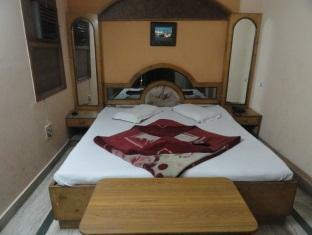 Atleast one exhoust fan mut be set in the bathroom, then it will be the best budget hotel of deluxe room. Foods cooked in the hotel were cheap and tasty. it was pretty rancid, but there are worse places to stay in dehli. for the price, you can get better in the areajsut wander around. there are literally 100s of hotels within 100meters of the place! Sheets and pillow cases were filty, like they have never chanced the sheets! Dirty and a bit scary place! We were freezing in our room!!! do not take Delhi sight seeing from the hotel. its cheaper and better from the public transport. in general all the prices are 4-5 times lower than you are told. make a local friend, it helps. bring passport photocopies and passport photos with you to get a Sim card there. roaming does not work. the rooms were dirty and the whole establishment downright terrifying. the 'air con' was a joke and we spent one night cradling our valuables and then got out of there as fast as we could the next morning. there is not one positive thing to say about this place. we had booked it for 3 nights but were happy to lose the money just to be out of there in one piece ! situé dans un quartier populaire l'hôtel n'est pas accessible en voiture car la route est trop étroite. Il est situé dans un quartier populaire. L'environnement est assez sale. Il en est de même pour l'entrée de l'hôtel. Je suis arrivé en pleine nuit et j'ai été accueilli par le réceptionniste qui dormait dans le hall ainsi que deux autres employés. Si je n'avais pas été accompagné par mon loueur de voiture, je n'aurai pas pu me faire comprendre. Les deux chambres n'étaient pas spécialement réservées, mais elles étaient libres, on ne semblait pas nous attendre spécialement. C'était sale et nous avons dormi dans nos draps. Соотношение цена/расположение отличное. Все остальное было не важно, т.к. останавливался в отеле буквально на пол-суток (как, полагаю, и большинство туристов, едущих в Агру на 1 день). От дверей отеля до Тадж-Махала пешком буквально 5-7 минут. В отеле в кафе такскают пивко с магазина и продают, хоть его и нет в меню. Есть вайфай. В целом - отличный вариант ночлега за копейки.